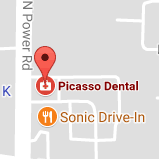 At Picasso Dental, we are proud to offer you the best in leading-edge dentistry with a professional staff that boasts state-of-the-art techniques and practices, which has made us the who we are today. Our doctors, Mark Anthony, DDS, and Tyrel Beavers, DMD, have been in the dental field for many years and are dedicated to providing the best oral health procedures in an atmosphere that is personal, caring, and warm. We are excited to announce the American Society of Implant and Reconstructive Dentistry (ASIRD) has selected us as the top implant team in our area! The Society limits membership to one implant team in each geographic region and membership is by invitation only - we are thrilled to accept this honor, and to continue to provide exceptional implant services to our patients. In addition to general hygiene services, including scaling and root planing, we also provide bonding, veneers, teeth whitening, and tooth-colored fillings. Our prosthodontic services also include implant crowns and dentures. Many of our patients drive long distances to be treated here at Picasso Dental, where every procedure is considered an art. We make it our business to go the extra mile for you, taking time to answer all of your questions, offering blankets if you are cold and need to snuggle, and the Doctor calling you on the evening after dental treatment to make sure you are okay. Besides the depth of knowledge of our doctors, our patients also choose Picasso Dental, for our insurance expert, Maureen. Maureen will go the distance with insurance companies, writing appeals on our patients' behalf in order to pursue extra payment when appropriate. The fact is that our entire staff is always watching out for your best interests, and we stay in close communication with each other when it comes to making sure you get the correct treatment you deserve. Most dental practices are closed on Fridays in our area, but at Picasso Dental, we are open on Fridays from 8:00am to 1:00pm in order to give you more appointment options. We are here to help you with any dental issue you or a family member may have. Call us today!